Getting a pay raise while sitting on the couch? Sign me up! Thanks Medtronic for another raise! This morning the Board of Directors at Medtronic plc (MDT) were at it again giving investors yet another dividend increase. The quarterly payout was increased from $0.38 to $0.43. That's an excellent 13.2% increase! This raise is also the 39th consecutive year of increases from Medtronic and marks the company with the title of Dividend Champion. Shares currently yield 2.01. Since I own 92.126 shares of Medtronic in my FI Portfolio this raise increased my forward 12-month dividends by $18.43. This is the 4th dividend increase I've received from Medtronic since initiating a position in 2012. The cumulative dividend increases over that time have amounted to 65.4%! According to USInflationCalculator the total rate of inflation over the same time period is just 4.6% so Medtronic is increasing my income much faster than the negative drag of inflation. That's exactly what you want to see from you dividend growth investments. 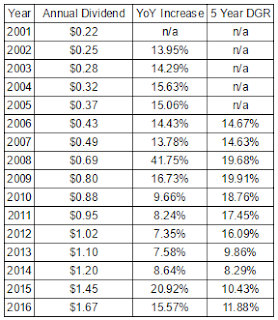 Consistent and strong dividend increases will lead to some truly amazing results over time. It's a bit hard to tell just by looking at the table, but your income would have increased by 760% if you purchased shares in 2001 and held through today. Medtronic's dividend still appears very safe. Medtronic earned $2.48 over the last twelve months putting the new dividend payout at a 69.4% payout ratio. However, there were one time expenses reflected in those numbers and Medtronic is expected to earn $4.66 per share for the current fiscal year which moves the payout ratio to a much more palatable 36.9%. Even with the one time expenses during the last year the free cash flow payout ratio still comes in at a very solid 50.4%. Realty Income might not wow investors with big dividend increases, but they're nothing if not consistent in their march higher. Medtronic has done very well for me since I became an owner. Over 60% income increase and a 100%+ price appreciation return is great to see. However, we invest for the future so I like to use the Gordon Growth Model as a quick reference to determine whether the company could be attractively valued and therefore need more research. The following table shows the required dividend growth rates in order to provide varying annual returns. Based on the Gordon Growth Model, Medtronic appears to be a candidate for the further analysis. The required dividend growth is very attainable considering the historical growth rates, low payout ratio, expected earnings growth over 7% per for the next 5 years and the wonderful healthcare industry and its huge global tailwinds. My forward dividends increased by $18.43 with me doing nothing. That's right, absolutely nothing to contribute to their operations. Based on my portfolio's current yield of 2.98% this raise is like I invested an extra $618 in capital. Except that I didn't! One of the companies I own just decided to send more cash my way. That's how you can eventually reach the crossover point where your dividends received exceed your expenses. That's DIVIDEND GROWTH INVESTING AT WORK! 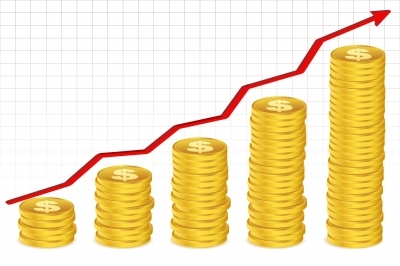 The beauty of the dividend growth investing strategy is that you build up your dividends through fresh capital investment as well dividend increases from the companies you own. For a dividend growth investor there's not much that's better than hearing news of a dividend increase. So far this year I've received 26 increases from 23 companies increasing my forward 12-month dividends by $151.44. My FI Portfolio's forward-12 month dividends increased to at $5,592.37 and including my Loyal3 portfolio's forward dividends of $63.68 brings my total taxable account forward dividends to $5,656.05. Do you own shares of Medtronic plc in your own portfolio? Health care is one of my favorite industries for the long term, where's it fall on your list? No I don't own MDT but I wanted to buy back in 2010, on the dip. I wish I did cause it is just a great stock. Keep bringing this data as it is really helpful. Good luck with the forward dividends. I love the healthcare industry for the long term because well it has a captive audience. Medtronic is solid and I can't wait to see what another 4 year holding period does to my dividends and the price appreciation. MDT has been on my watchlist for a while, but the price has not been right. If it does become attractively valued, I'd love to jump on it. I've been in much the same boat as you except I happened to add some at a good price several years ago. MDT is wonderful and the health care space has some great tailwinds. Also I think MDT is working on an artificial pancreas which could be a boon for them with all of the obese and diabetic people. There's a huge market with that one. Where did you get those graphs for dividend history? I made the graphs myself through Google sheets but I'm always looking for ways to better the process.